Fig 1. The Qinghai-Tibet Railway in operation. Photo taken by Lihui Luo. The central Qinghai-Tibet Plateau (QTP), from Geermu (Golmud) in the Qinghai Province to Lhasa in the Tibet Autonomous Region, features important engineering infrastructures, including the Qinghai-Tibet Railway (QTR), the Qinghai-Tibet Highway (QTH), a petroleum pipeline, a high-voltage electric power transmission line, and a fiberoptic cable. 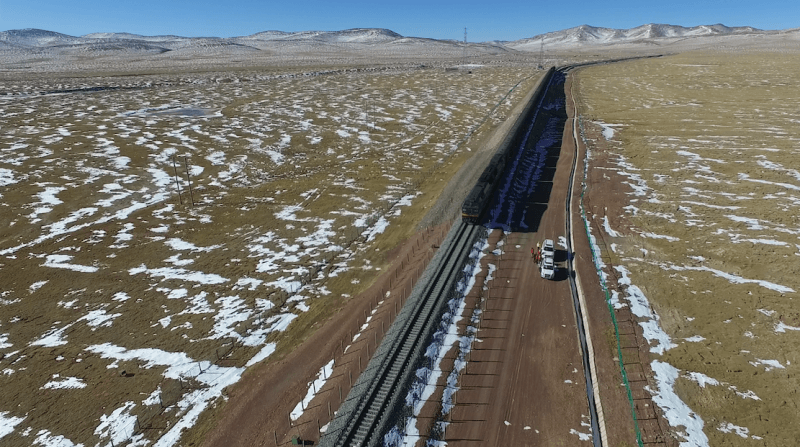 The infrastructure is known as a critical engineering and transportation corridor, named the Qinghai–Tibet Engineering Corridor (QTEC), connecting inland China with the QTP, and also is the most frequent and most densely-populated area in the QTP. The alpine ecosystem changes in the QTEC, including alpine vegetation and permafrost, are driven by global climate change combined with human activities. Until now, most studies focused on climate change impacts on the ecologically-important QTP, with little attention to the much smaller area of the corridor under intensive human activities. The average elevation in the corridor is approximately 4,700 m, with approximately 80% of the area exceeding 4,000 m. The vegetation along the QTEC is dominated by alpine steppe and meadow, which provide essential ecosystem services to people living in the area. Permafrost is an important feature of the QTEC, extending for approximately 531 km in the center of the QTEC. The QTR stretches for approximately 1,142 km from Golmud to Lhasa and is considered a landmark project, as it was the first time in history that railway transport had been introduced into Tibet from inland China, which has broken traffic bottlenecks that hindered the economic and social development of the QTP. Since the opening of the railway in 2006, the QTEC is experiencing an unprecedented intensity of human activity. The area surrounding the QTR is a unique and vulnerable high-altitude ecosystem that was the cause of serious concern in the early construction of the railway. The ecological protection measures adopted during and after the railway construction ensure that the railway is built “a green railway” (see Fig. 1). The construction and operation of the QTR emphasized the protection of soil, vegetation, animals, and water resources that minimize the direct impact of the QTR on the alpine ecosystem. However, what is the impact of the Qinghai-Tibet Railway on the Alpine ecosystem? The QTEC experienced a significant warming and wetting trend, with direct and rapid effects on the alpine ecosystem. In the last more than 20 years, the air temperature has risen by more than 0.56 °C; the total precipitation has increased by more than 30 mm. Increased total precipitation improved the vegetation conditions across much of the QTEC, while increased air temperatures accelerated the thaw of permafrost. The opening of the QTR brought a surge of visitors and permanent residents. The tourism industry expanded rapidly, and the large influx of visitors provided a boost for the local economy. The southern reach of the QTEC is located in Tibet. Due to the unique natural environment and cultural characteristics, Tibet has long been a desirable travel destination for the people of China and abroad. However, tourism development in Tibet has been hindered by its remote and inaccessible location. Travel to Tibet has increased substantially since the opening of the QTR in 2006. In 2007 alone, the number of tourists visiting the Potala Palace was more than 50 times that observed before the opening of the QTR. The city of Lhasa and its surroundings have become the most visited area of the QTP, experiencing a growth rate in tourism that exceeds that of any other area of the QTP. Interestingly, the number of tourists visiting Lhasa outnumber the resident population by more than 10 times. Alpine meadows and shrubland used for grazing were the main vegetation types, the Tibetan part of the QTEC has some of the most important grazing areas in Tibet. Economic development generated a strong demand for livestock and led to a rapid development of livestock raising. The total number of livestock in the Tibet also showed a significant increase. Several years after the QTR opened, large logistics centers were built in Tibet along the QTR. There was a more than 75% increase in the goods carried to and from Lhasa by the QTR in 2010. The operation of the railway has led to a rapid economic growth in Tibet, which has led to an increase in population, livestock, automobiles, and so on, as well as an unprecedented increase in the intensity of human activity. The alpine ecosystem on the QTP is extremely fragile and is under pressure. The alpine vegetation activity in the QTEC generally increased, especially in the Qinghai zone. However, in the Tibet zone, the area of vegetation degradation greatly increased. Furthermore, vegetation deterioration was more severe near the QTR and QTH in the Tibet zone. The alpine ecosystem was improved mainly due to the warmer and wetter climate variability and the positive effects of ecological conservation and restoration projects. 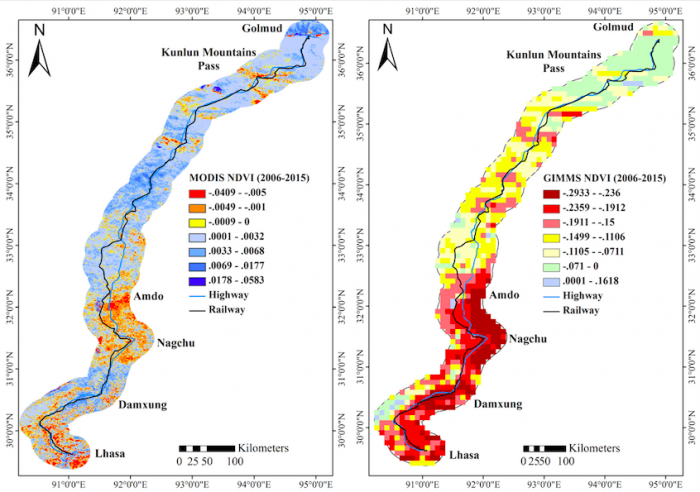 The railway and the deterioration of alpine vegetation have a strong spatial correlation in Tibet, despite some improvements in areas where vegetation dynamics are dominated by human activities (see Fig. 2). Overall, however, the degradation of vegetation in Tibet accelerated following the opening of the railway. The QTR promotes the development of local economy probably at the expense of the natural environment. Fig 2. Spatial distribution of the growing season (May-Sep) normalized difference vegetation index (NDVI) trend in the QTEC from 2006 to 2015. The units are yr-1. Data came from moderate-resolution imaging spectroradiometer (MODIS) and Global Inventory Modelling and Mapping Studies (GIMMS). Image courtesy Lihui Luo. China launched large-scale conservation programs to slow down grassland degradation in the QTP, including Grain-for-Green in 1999, and Grazing Withdrawal in 2003. Pastures were fenced, and grazing areas were reduced. At the same time, economic development generated a strong demand for livestock and led to a rapid development of livestock-raising. More livestock and smaller pastures led intensified grazing pressure and increased deterioration of pasture lands. Meanwhile, the nomadic lifestyle is disappearing quickly. Instead, modern urban lifestyle is much more common for most Tibetans in today’s China. Moreover, grazing depends on modern transportation, so the pressure of grazing is even greater in regions that include convenient transportation. In summary, the Tibet is experiencing unprecedented ecological pressures. Economic development and population growth have both exerted negative impacts on alpine vegetation. Although the warmer and wetter climate trend observed has proven beneficial for enhancing alpine vegetation greenness, the declining trend of alpine vegetation has tended to be higher in relatively stronger human activity regions. Permafrost has been retreating and degrading at a rapid rate due to the combined influence of steadily increasing human activities and persistent climatic warming. In recent decades, the rate of permafrost thawing increased significantly, increasing permafrost active layer thickness was mainly influenced by the rise in air temperature. Moreover, permafrost in the QTEC has degraded at both ends, with the degradation in the southern reaches being more striking than that in the northern area. Extensive and accelerated degradation of permafrost has also been observed in response to climate warming along the QTEC. However, several studies have shown that the permafrost active layer thickness values near the QTR were greater than those in other regions. These result showed that the intensification of human activities caused by the QTR also played an important role in the degradation of permafrost. To obtain more insight into the ecological effects of the QTR on the alpine ecosystem, the QTR was used as a trigger factor to perform a long-term vegetation vigor study at the QTEC. In terms of scope and extent of impact, previous work has also tended to ignore the effects of distance between alpine vegetation and the QTR, although this effect is not directly. Moreover, the spatial range of the ecosystem impact of human activities along the QTR in the QTEC is limited. In the future, we will take the QTR as the buffer zone and make the intensity of human activities spatially to analyze the relationship between the intensity of human activity and the alpine ecosystem. This will provide stronger evidence for the impact of the intensity of human activity brought about by the operation of the QTR on the alpine ecosystem. These findings are described in the article entitled The impacts of climate change and human activities on alpine vegetation and permafrost in the Qinghai-Tibet Engineering Corridor, recently published in the journal Ecological Indicators. This work was conducted by Lihui Luo, Wei Ma, Yanli Zhuang, Yaonan Zhang, Shuhua Yi, Di Ma and Zhongqiong Zhang from the Northwest Institute of Eco-Environment and Resources, Chinese Academy of Sciences, Jianwei Xu from the Hunan University of Arts and Science, and Yinping Long from the Chengdu University of Information Technology. "Lihui Luo develops Permafrost Indices Computing (PIC) packages, and then integrates the PIC into different platforms (cloud computing platforms and data sets) to evaluate the permafrost condition with climate change and human activities." Yanli Zhuang is an environmental scientist at Chinese Academy of Sciences | CAS · Cold and Arid Regions Environmental and Engineering Research Institute.